Bring new life to a fading mall brand. THE SELF-PROCLAIMED "LOUDEST STORE IN THE MALL"
Hot Topic specialized in counterculture clothing, accessories, and music. Built during the age of MTV, it was a place that championed music and the rebellious spirit that surrounded it. MTV was fundamental in shaping teenage culture at the time – with the birth of new musical genres and sub-genres the boundaries for self-expression were expanding. Hot Topic became a safe-haven for the self-proclaimed misfits. These were kids who didn’t care much about how they were labeled, leaned towards the “edgier” side of things, and were going to the store to investigate what was new. At their peak, Hot Topic was a cultural gatekeeper – successfully anticipating and adapting to trends while staying true to their rebellious spirits. In attempts to stay ahead of pop culture, Hot Topic has diluted their image by spreading themselves too thin and losing sight of their musically-oriented roots. Their trend-driven model imploded, especially as we're seeing the decline of mall and the rise of social media influencers who are dictating what is on trend. While trying to keep up, Hot Topic has become product-driven; focusing on hashtags, memes, or whatever the Internet has decided is “cool” this week. A brand that was once synonymous with counterculture has fallen off their radar. Instead they’re going through friends, social media, and their favorite celebrities to explore, discover, and curate for themselves. The rebellion that Hot Topic harnessed isn’t gone, it’s just being expressed differently. The spirit of rebellion has been replaced with the spirit of nonconformity. Rather than simply standing against something, we’re taking it a step further by challenging the things we disagree with. Having an opinion about what's happening in the world – on everything from the new Kendrick Lamar album to Donald Trump's frequent trips to Mar-a-Lago – is critical to our identity. Hot Topic has an opportunity to stand for something again and rebuild their credibility in a new, digitally-driven era of pop culture. Hot Topic is a destination where people are able to shape their identities through the exploration of what’s new in music and pop culture. Hot Topic is a gatekeeper of pop culture, anticipating and curating what upcoming trends are on deck. Hot Topic's employees are a key part of maintaining the brand's credibility. The music may change, the scene may change, the style may change – the spirit of the underground never does. We're going to reclaim Hot Topic’s authority as the destination for all things related to music and the culture that comes with it. 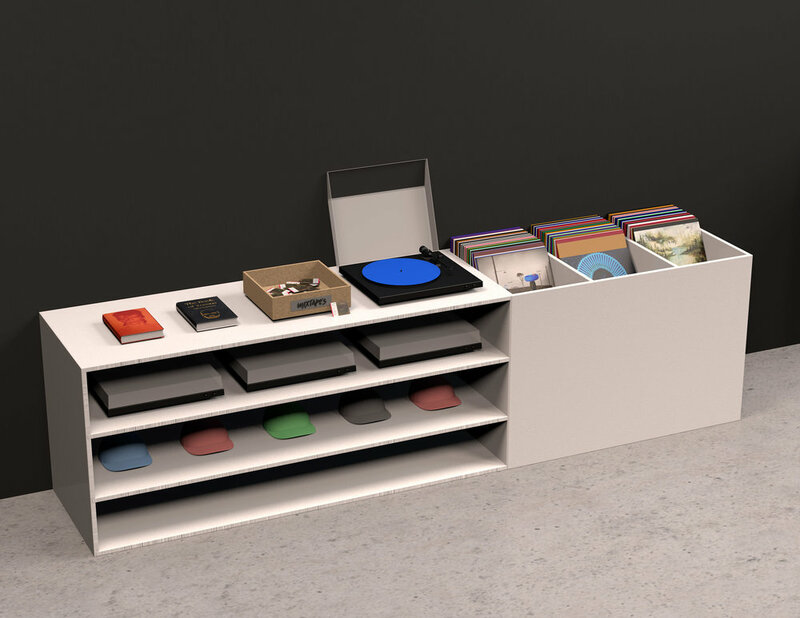 Declutter the space for a more open and music-focused destination store – featuring a screen at the front of the store which loops music videos and exclusive Hot Topic content. Streamline merchandise to focus on clothing, music, and music-related products. A card with an exclusive download code that grants access to artists' music – with an emphasis on supporting local musicians. Stage One: Hot Topic's Music Consultant Bar, where employees are able to assist people with anything from understanding Frank Ocean's decision to sit out of the 2017 Grammy Awards to how local musicians can approach setting up their band's social media accounts. Reveal our new branding by reimagining the most iconic part of the retail store: the t-shirt wall. The wall doubles as a billboard where people can buy physical shirts, before revealing the new tag and directions to the closest Hot Topic. 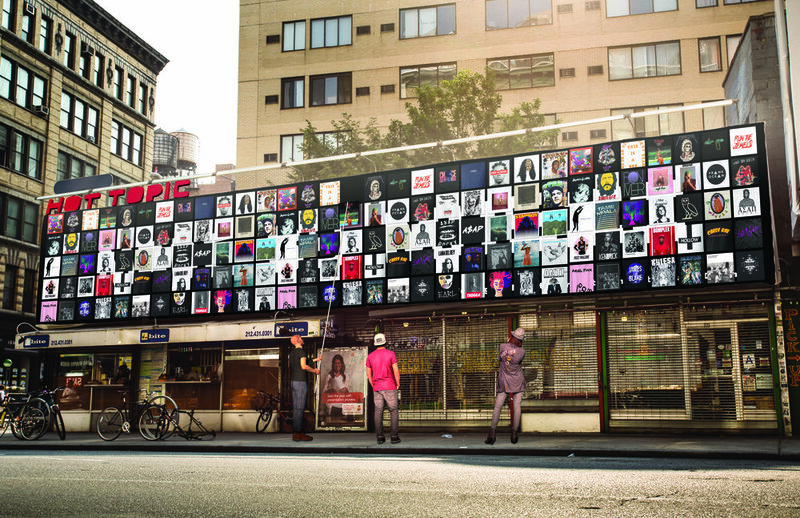 A live digital billboard will double as an interactive product-buying experience. The billboard will regularly update with collections of t-shirts that anyone passing by can order. A Facebook chat bot integration allows people to use their Facebook account to send the digital Hot Topic T-Shirt Wall a message. The wall responds with the option to buy a shirt and have it shipped to an address or picked up at the nearest Hot Topic Store. Step 1: Walk by the wall. Step 2: Talk to the wall via a Facebook Messenger Chatbot. Step 3: Order a t-shirt. Hot Topic will work directly with musicans to co-create, market, and distribute limited runs of artists merchandise during their tour and in-stores at Hot Topic. Hot Topic can ease the chaos of waiting in line to buy a concert t- shirt by catering the interactive experience specifically to an artist's tour. Flagship locations in NY & LA will act as Hot Topic's home base. Both flagships stores will double as a concert venue, featuring a stage to host musicians and events. Mall locations will be evaluated to focus on the highest preforming stores with the heaviest foot traffic – closing down less profitable stores. Destination locations act as anchor stores in downtown areas of secondary cities and aim to redirect traffic from former mall locations. By going back to Hot Topic’s musical roots, we are reclaiming our identity, standing for something again, and operating with a purpose. Decluttering merchandise to cross-pollinate between music, pop culture, and everything in between enables us to reconnect with our target. We're building brand longevity by taking stock of what’s relevant in culture and being selective in our retail offerings. Hot Topic is about music, we're not catering to everyone and everything.